_Matsya, the one-horned fish, is the first among, the Dasa Avatara, the ten incarnations of Lord Vishnu. The core concept of Hinduism (Sanatana Dharma) is that there is no beginning or end. There is only transformation. When man abandons Dharma and ventures into the territory of Adharma, Nature starts its destructive transformation. We humans term this as apocalypse or total annihilation. Lord Vishnu incarnated as Matsya to save all that was good in the world before its destruction. Just before the total destruction of the world, Matsya, the one-horned fish, swam into the hands of a pious man and asked him to save it from a big fish. The pious man took the fish home and placed it in a small vessel. The fish kept on increasing its size. It was then transferred from the small vessel to a big vessel; from it to a well, from well to a pond, from pond to a lake; and finally it was transferred to the ocean but it still kept growing. The pious man in some Puranas is Manu, in some other Puranas it is Satyavrata. 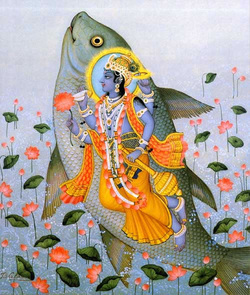 The pious man realizes the fish is Narayana and prostates before it. Matsya then told him that there will be a Mahapralaya in seven days. Matsya requests him to gather the seeds of all plants and a pair each of all living beings. He is asked to put them in a ship and wait for the deluge (Mahapralaya). Matsya also tells the pious man that it will again appear during the deluge and he will need to tie the boat to its horn using Snake Vasuki as the rope. In some versions, Matsya sprouts the horn and uses Ananta Sesha as the rope and navigates the boat to safety without the help of the pious man. In Bhagavad Purana, the boat is not build by the pious man but instead it appears before the deluge and he has to enter it with the seeds of all plants. When the boat was tossed hither and thither in the massive flood, Matsya appeared near the boat and Satyavrata tied the boat to the horn of Matsya using Snake Vasuki as the rope. Matsya navigated the boat safely to the top of Mount Meru. When the deluge was taking place, a demon named Hayagriva with the face of a horse stole all the Vedas and sasthras from Brahma. and hide them in the deep sea.After a terrible fight with the Hayagriva,Vedas are restored and returned to the Brahma.